Andy writes, "I purchased songs from iTunes Music Store and I locked all of my songs so my sister couldn't use them, and now I don't know how to unlock them. We are now only using one user on Windows XP. Would you know how to unlock these songs so I can play them on my PSP?" iTunes Music Store songs not playing on your PSP isn't something you did specifically; it's by design. Apple uses copy protection on all items purchased through the iTunes Store in order to prevent you from playing the songs anywhere but on your iPod or on an authorized Mac or PC. Sony's PSP is not an iTunes supported device. If your PSP is the primary device you plan to use for playing back songs on the go, I would suggest buying CDs and ripping them rather than relying on iTunes as your method of song acquisition. You spend less time working with your music files to get them where you want and more time actually listening or doing something fun. There is a legal (although somewhat time consuming) way around this problem. One option would be to purchase software that automatically converts your iTunes purchases to MP3. An app called SoundTaxi does this quickly, basically automating the free method I describe below. If you have more than a few songs to convert for PSP playback, use SoundTaxi. Your other option for playing songs purchased from iTunes on your PSP, is to burn them to a CD first. Apple allows you to make an audio CD in iTunes by burning tracks from your iTunes library to disk. These can be several songs from the same artist or a playlist of your favorite tracks from many artists. First create a new playlist in iTunes and name it something like "New Audio CD". Add songs to your playlist until you have approximately 72-minutes of music, which is the maximum supported by Audio CDs. Verify your CD burning preferences in iTunes by opening Edit > Preferences > Advanced and checking the button next to Audio CD on the Burning tab. 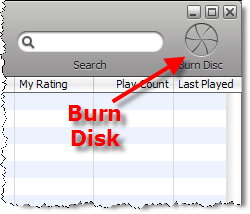 After verifying preferences, click the Burn Disk button. Once the disk is burned, you can rip the songs on the disk as MP3s either using iTunes or Windows Media Player.